Cuba may soon rely more heavily than ever on oxen to save fuel normally used by heavy machinery. 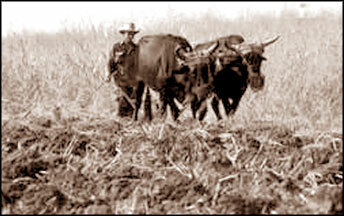 Diosdado Mena works his oxen in a field in Los Palacios, Cuba. In China it's the year of the ox? and it could be for Cuba, too. President Raul Castro is promoting the beasts of burden as a way for the economically strapped communist country to ramp up food production while conserving energy. He recently suggested expanding a pilot program that gives private farmers fallow government land to cultivate ? but without the use of gas-guzzling machinery. "For this program we should forget about tractors and fuel, even if we had enough. The idea is to work basically with oxen," Castro told parliament Aug. 1. "An increasing number of growers have been doing exactly this with excellent results." Cuba's economy was devastated by three hurricanes last summer, and the global recession has left the government short on cash to cover debts. As a result, it has slashed spending and cut domestic production and foreign imports, causing shortages of such basics as cooking oil, ground beef and toilet paper. Though the island gets nearly 100,000 free barrels of oil a day from Venezuela, it also has begun a campaign to conserve crude. The agricultural ministry in late June proposed increasing the use of oxen to save fuel, as Cubans have seen a summer of factories closing and air-conditioners being shut off at government offices and businesses to save oil. The ministry said it had more than 265,000 oxen "capable of matching, and in some cases overtaking, machines in labour load and planting." In the farming initiative that began last year, about 82,000 applicants have received more than 1.7 million acres so far or 40 percent of the government's formerly idle land. The program seems to have slightly increased production of potatoes and tomatoes in season, but the government has provided no official figures. Shortages in Cuba are not new. And neither are oxen. Thousands of Cuban farmers have relied on the beasts in the half century since Fidel and Raul Castro and their rebels toppled the dictator Fulgencio Batista. "The ox means so much to us. Without oxen, farming is not farming," said Omar Andalio, 37, as he carefully coaxed a pair of government-owned beasts through a sugar-cane field last week.